Big boxes of panettone are a common Christmas leftover in many homes. Those giant sweet dough cakes that look so pretty in their cardboard boxes, never seem to get opened before New Year’s Eve. Fortunately a bought panettone keeps well into January and today I’m sharing something I made several Januarys ago so please forgive the less than brilliant photos. I thought it was worth publishing as so many people will be wondering what to do with leftover panettone. 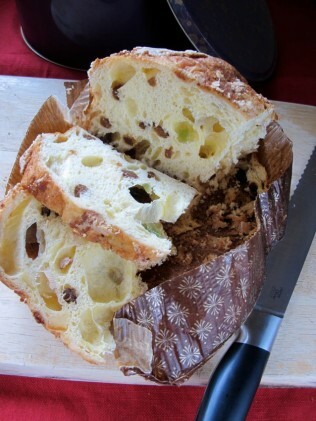 I was introduced to panettone by my Italian housemates Anastasia and Marco in the late 90s. Away from home, in a London less foodie than today, they were delighted to discover panettone on sale locally in the Hammersmith branch of Habitat. I was equally excited by the goodies on sale in Habitat each Christmas. On chrome metal racks, displayed in a similar fashion to Harvey Nichol’s Food Hall or similar to Carluccio’s today, Habitat stocked festive foodie items from overseas and especially Italy. Panforte from Siena in Marco’s native Tuscany, bright red tins of paper wrapped Amaretti biscuits and in an array of sizes, dangling from ribbon loops, panettone and its sister pandoro. They looked so exotic and sophisticated yet inexpensive for their size. I bought one for every family member back home, convinced they’d not have seen them before either. Marco told me Italian families grill slices of panettone sprinkled with sugar for breakfast although we tended to eat it as it was or dunk it in trifles. But today I’m thinking of using up panettone after New Year when many of us will have struck sweet treats from the menu. 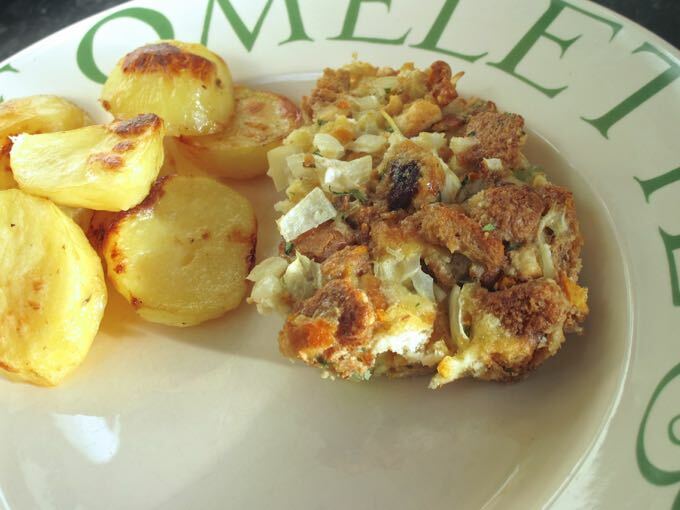 My solution is a really easy recipe to use up panettone in stuffing for the Sunday roast. If you’ve got any clementines still knocking about in the fruit bowl you can use those too or any oranges will do. Wash them before chopping the peel to remove any wax on the surface. I love to pair sweet and savoury food at Christmas – as I recently mentioned in my bread sauce video, I serve my parsnips with dates and drizzle maple syrup over my carrots. So it seems very natural to use a bready cake in post Christmas stuffing although I’d probably draw the line at chocolate panettone! 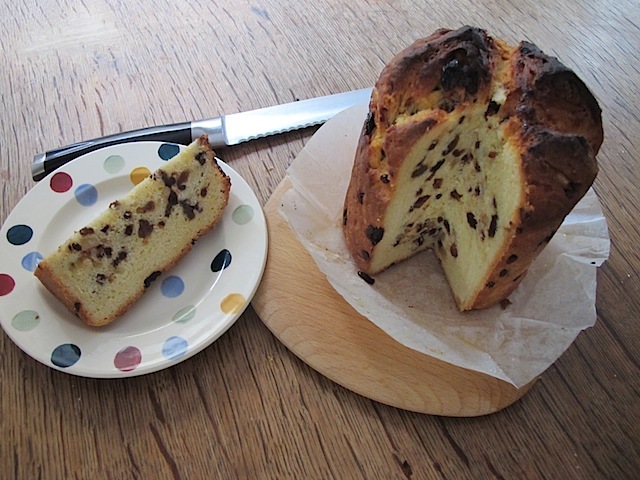 If you’re feeling adventurous to make your own panettone see also my post “Easy panettone recipe that practically bakes itself“. 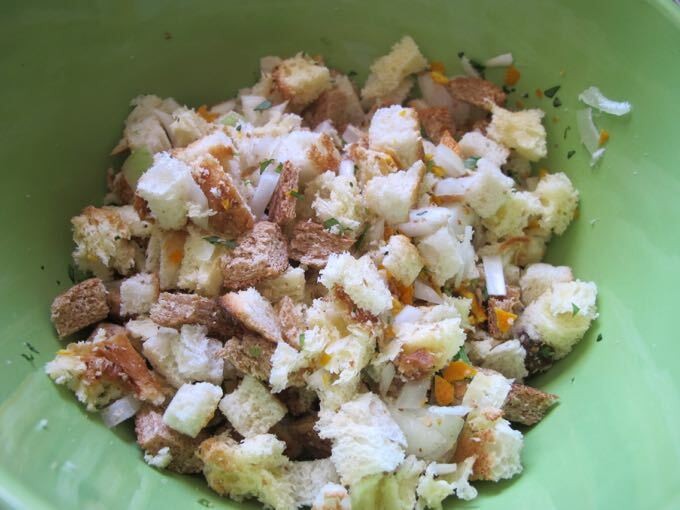 Slice leftover panettone cake into dice and toss in a bowl with some diced brown bread, onion, tiny diced orange peel and chopped parsley. Add two eggs and stir. Bake in the oven at 190c / gas 5 for around twenty minutes until golden on top. And serve – we had ours with roast potatoes and chicken. 1. Preheat the oven to gas mark 5 / 190c. Slice the panettone and brown bread into dice. 2. 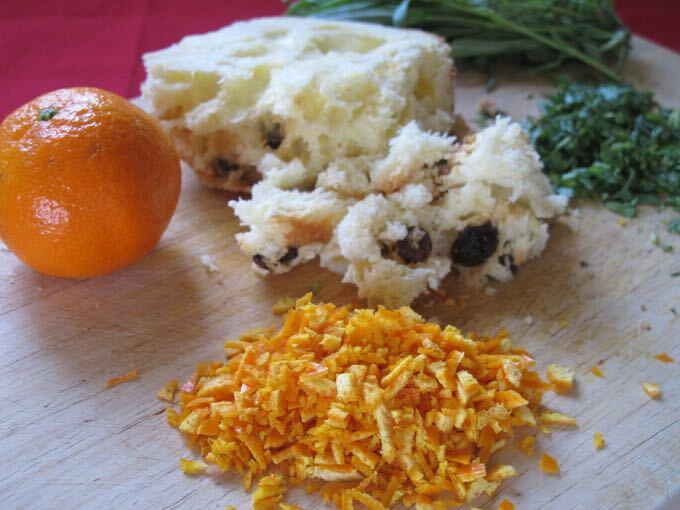 In a medium size mixing bowl, combine the panettone, bread, onion, clementine peel and parsley. Add the eggs and mix. 3. Decant the mixture into a greased oven proof baking dish and bake for around 20 minutes until golden on top. Fruitcake or gingerbread. Why not? 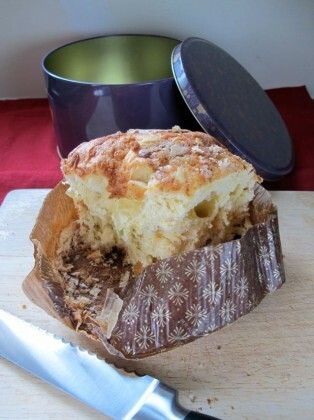 Unfortunately I have used my panettone already, but what a great idea! I don’t have a panettone this year (we will be away for awhile so reserves of everything are low) but what a fab idea, Sarah. Pinning etc for later or if I get given one last minute and we don’t make eggy bread with it! And I used to love going into 90s Habitat for foodie adventures too! Homemade stuffing is one of the things I’ve not really done much. Very rarely, but I have always thought it a step too far for a lazy cook. BUT this one looks so good I am very tempted! Oh you should! It’s so easy – I always have a supply of dried bread crumbs in jars because I blitz ends of old loaves into crumbs then bake. It’s as simple as adding breadcrumbs to chopped onion, egg and interesting bits. 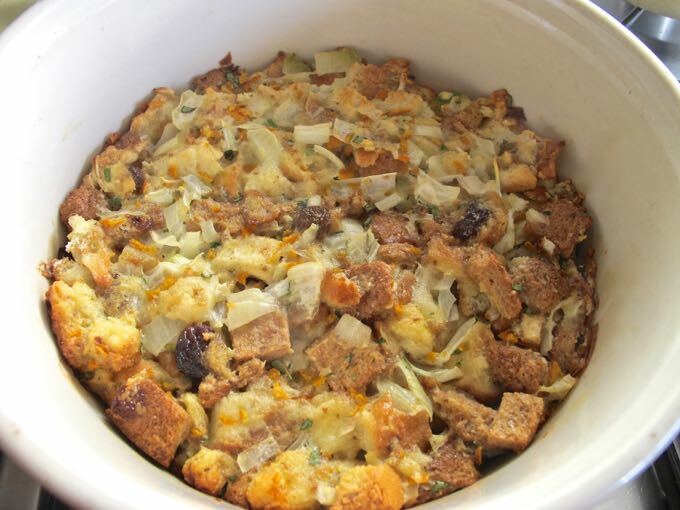 This panettone stuffing is just the glam version!! I’m a lover of chocolate chip pannetone and it seems to me like the french toast option is absolutely BRILLIANT. 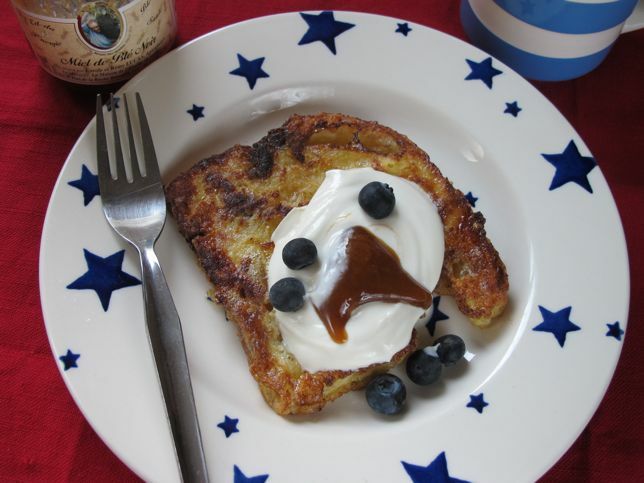 Is it just me or does the french toast have a slightly frowny face? What a great idea. This looks delicious! I love stuffing more than the best at Xmas. This would work so well and must smell so festive. I love sweet combined with savoury too so this is a winner for me! I think it might be my favourite part of Christmas lunch too. Perfect for using up the last bits! I am lucky that my MIL is doing the stuffing so I just have to turn up and eat. I really like this idea though. Clever idea! am sure the absorbent texture of pannetone must be a great idea for a flavour packed stuffing. Happy New Year Sarah! I have to admit to really not liking Panettone, I find it dry and dull 🙁 However, using it in a stuffing, or as you suggested doing it the Italian way & grilling & sprinkling with sugar could well be the answer!